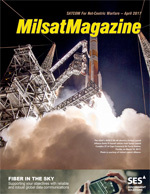 The majority of airborne inter-communication systems employ a star topology architecture, in which a central communication unit is connected by dedicated wiring to each operator’s audio control panel. This star topology was suitable in its time but has several drawbacks when advanced audio capabilities such as spatial 3D audio are required. One main drawback of the star topology is limited computational capacity of the central communication unit required for spatial 3D audio implementation in a dedicated manner for each operator. The algorithms for dynamic 3D positioning of audio resources require extensive computations per airman. This is challenging without dedicated computing power for each airman. Additional shortcomings of the star topology are the central communication unit being a single point of failure, the lack of inherent system redundancy, a lack of incremental scalability, and lack of system flexibility. A patented Dual IP Ring topology that overcomes all these drawbacks has been invented by ORBIT. In this novel approach the Communication Control Panels (CCPs) are cascaded in an Ethernet Dual IP Ring and communicate using an IP based deterministic avionic protocol. The CCP is a hybrid of an “End-System” and a “Switch” eliminating the need for a central communication unit and thus reducing system SWaP-C (Size, Weight, Power and Cost). Dual IP Ring architecture provides significant benefits for implementation of spatial 3D audio. The algorithms for dynamic 3D positioning of audio resources, according to the airman’s helmet line-of-sight or his location relative to other crew members require dedicated and extensive computations per airman. With ORBIT’s novel approach each additional CCP adds resource capabilities and computing power dedicated to each airman and crew member, ideal for supporting spatial 3D audio and advanced noise reduction algorithms. Inherent redundancy is achieved by each CCP transmitting IP packets in both directions on the ring simultaneously, providing continued normal operation without degradation even upon failure of a network segment. The innovative Dual IP Ring architecture is ideal for implementation in all aircraft categories and offers exceptional 3D audio, noise reduction, system redundancy, incremental scalability and flexibility; all with a reduced SWaP-C. The majority of airborne inter-communication systems employ a star topology, in which a central communication unit is connected to the audio control panel of each operator. The aircraft’s audio communication, navigation and warning systems are all connected to the central communication unit which acts as a gateway and distribution hub. This topology has several drawbacks as described below. A main drawback of star topology is the finite and limited computational capacity of the central unit for spatial 3D audio implementation. 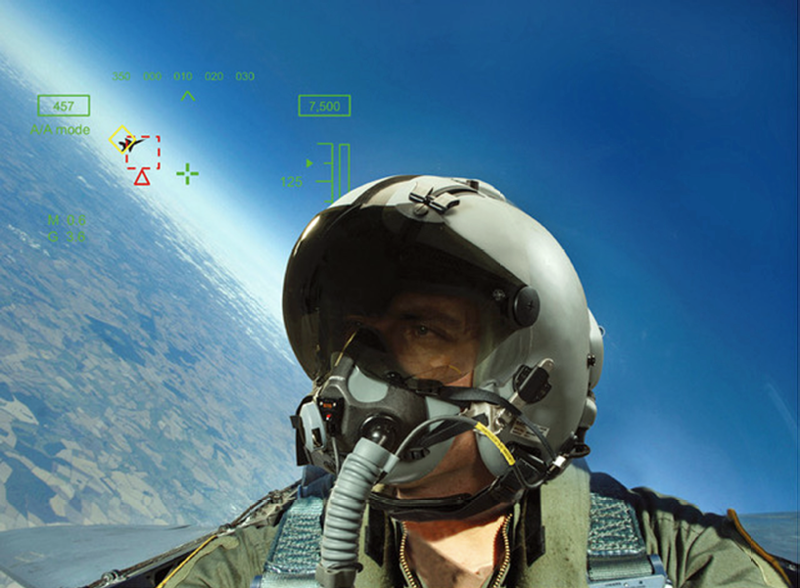 3D algorithms require extensive processing in order to position each audio resource in 3D space in a different and dynamic manner for each airman, according to each airman’s unique position relevant to other crew members and the dynamic line of sight of the airman’s helmet. This is challenging without dedicated computing power at each operator terminal. Additional drawbacks of the star topology are the central communication unit being a single point of failure, the lack of inherent system redundancy, a lack of incremental scalability, and lack of system flexibility. The following case sheds light on the lack of incremental scalability. Say a certain central communication unit supports 8 radios. If 9 radios need to be supported then a whole additional central communication unit has to be added, increasing SWaP-C.
Dual IP Ring is a patented intercommunication topology that overcomes the drawbacks of star topology (US Patent # 9,077,641). In this novel approach the Communication Control Panels (CCPs) are cascaded in a ring topology and communicate using an Ethernet IP based deterministic avionic protocol. The CCP is a hybrid of an End-System and a Switch; it inserts and extracts information from the network (as an End-System would do) and also routes the information to other CCP’s (as a Switch would do). This distributed approach eliminates the need for a central communication unit and thus reduces LRU count and system SWaP-C. The Dual IP Ring topology provides inherent redundancy, as each CCP transmits its IP packets in both directions on the ring, as illustrated by the blue and orange arrows in the figure above, effectively creating two IP networks. The result is continued normal operation without degradation even upon failure of a network segment. Dual IP Ring architecture also provides significant benefits for implementation of spatial 3D audio. The algorithms for dynamic 3D positioning of audio resources, according to the airman’s helmet line-of-sight or his location relative to other crew members require dedicated and extensive computations per airman. With ORBIT’s novel approach each additional CCP adds resource capabilities and computing power in an incremental and dedicated manner to each airman and crew member, ideal for supporting spatial 3D audio and advanced noise reduction algorithms. Spatial 3D Audio has significant benefits for pilots and other crew members, increasing situational awareness and reducing workload and fatigue, thus improving operational effectiveness and increasing flight safety. 3D positioning of audio resources, according to the airman’s helmet line-of-sight or his location relative to other crew members require dedicated and extensive computations per airman. In systems with a central communication unit this usually creates a computing capacity bottleneck. ORBIT’s 3D technology uses advanced binaural and psycho-acoustic principles, giving a unique and natural perception of sound as coming from a particular direction. With ORBIT’s Dual IP Ring topology, each additional CCP adds powerful computing power in an incremental and dedicated manner for each airman and crew member, ideal for supporting spatial 3D audio algorithms. ORBIT’s 3D technology uses advanced binaural and psycho-acoustic principles, giving a unique and natural perception of sound as coming from a particular direction. The result is consistent and accurate directional audio delivered into the ears of the mission-critical user, so that the spatial position of the sound source can be accurately located. Applications include radio separation, crew positioning, directional safety alerts and dynamic directional threat alerts. The Dual IP Ring distributed architecture allows increasing system capabilities in an incremental manner. In a star topology the maximum number of system resources supported (radios, NAV receivers, discrete inputs and outputs, etc.) is defined by the central unit’s capability. The computing power limitation is also defined by the central unit’s capability. Consider, for example, a star topology system with a central communication unit that supports up to 8 radios. If a certain program requires 9 radios then an additional central control unit has to be added, significantly increasing size, weight, power and cost. In the Dual IP Ring approach, each CCP adds its own resource capabilities (3 radios, 7 NAV receivers, etc.) and its own computing power. This incremental scalability allows ideal and cost effective matching of system capabilities to the requirements of the platform and results in improved SWaP-C.
Systems powered by Dual IP Ring possess outstanding flexibility—the basis for this is the ability to incrementally scale and match the system’s capability to the platform requirements. 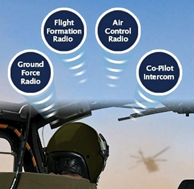 This flexibility is what allows a system based on Dual IP Ring to be ideal for implementation on small or large platforms in almost any aircraft category, whether it be trainers and combat jets, helicopters, business jets, commercial airliners, transporters, tankers or special mission aircraft. The Dual IP Ring topology provides inherent redundancy. Each CCP transmits its IP packets in both directions on the ring simultaneously, clockwise and counter-clockwise, effectively creating two IP networks. In case of a malfunction in a segment of the ring the system continues to operate normally without any degradation, as illustrated above, right. The Dual IP Ring topology also allows preservation of key functionalities while experiencing a hardware, software or network malfunction. Emergency mode provides redundancy in case of network failure in the Dual IP Ring. Backup/Slave mode provides redundancy in case of a CCP hardware or power failure. Dual IP Ring topology is a new and exciting approach to airborne audio intercommunication. The architecture overcomes several drawbacks of star topology. A significant benefit of Dual IP Ring is the dedicated computing power per airman required for spatial 3D Audio implementation. 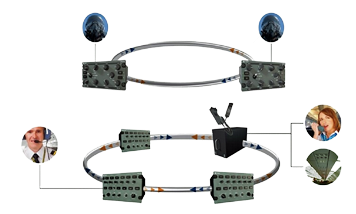 Additional benefits of Dual IP Ring include inherent redundancy, incremental scalability and outstanding flexibility, all with a reduced SWaP-C. Dual IP Ring is ideal for implementation on small or large platforms in almost any aircraft category, whether it be trainers and combat jets, helicopters, business jets, commercial airliners, transporters, tankers or special mission aircraft.